Of course, these being competitions focusing on junior skiers, they often are used as a proxy for signaling future performance. I’ve looked at various aspects of this in the past, but there are always new ways to approach this. The actual value I’ve attached to each point is the square root of WC points per race. We add up all the WC points for an athlete from OWG, WSC, WC and TDS events (pretending, of course, that these event all award WC points), divide by the number of races for that athlete and then take the square root. That last step is because otherwise the values are extremely skewed and don’t map well to a visual scale. Specifically, the Marit Björgen’s of the world make it very difficult to detect differences between more ordinary athletes. 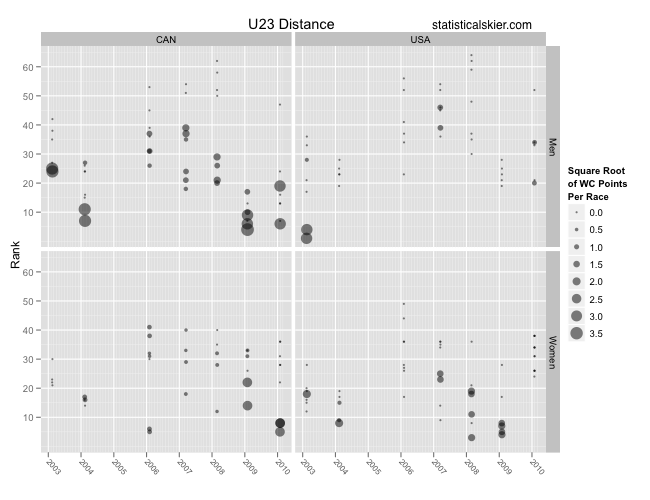 Dividing by the number of races helps to account for the fact that the more recent participants in WJC/U23s aren’t as likely to have scored WC points simply by virtue of being younger. This doesn’t completely eliminate that bias, but it helps. Obviously, this isn’t meant to literally represent WC points, just the rate of top thirty results in the future, on a scale that heavily rewards podiums and top 5’s. This is a somewhat fancy version with mouse-over tool tips. If your browser doesn’t like this image there’s a plain vanilla version here. Placing your mouse over a point should (assuming I did it right) reveal the athletes and their “square root WC points per race” value. Quite a few of the very small dots are a challenge, though. Squaring the values on the scale to the right will give you the corresponding “WC points scored per race”. 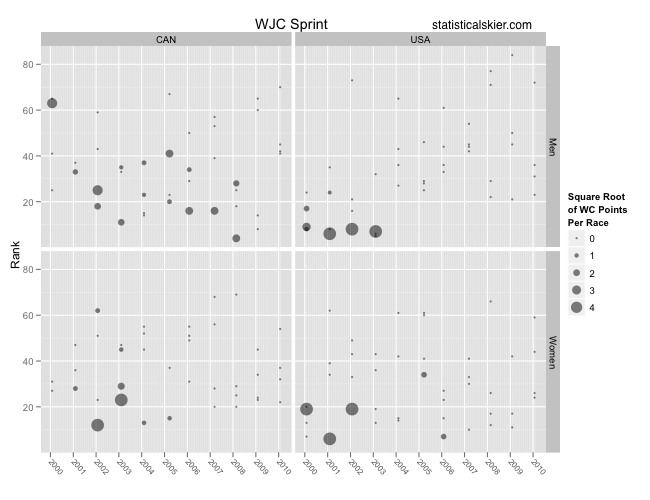 The size of each dot corresponds to the rate at which that athlete scored WC points going forward. Keep in mind that there will be the occasional athlete who has only done 1-2 WC level races but happened to have a good race that day. For the American women we see contributions (rates greater than zero) by Kikkan Randall, Morgan Arritola, Liz Stephen and to a lesser degree Rebecca Dussault and Abi Larson. For the American men, there’s a huge gap between Kris Freeman and Andrew Newell. They are followed by Noah Hoffman, Andrew Johnson, Leif Zimmermann and Rob Whitney. The Canadian men’s graph is dominated by the likes of Alex Harvey and Devon Kershaw, followed by Touchette, Butler, Grey, McMurtry, Nighbor and Nishikawa. The Canadian women obviously are topped by Beckie Scott and Sara Renner. A ways behind them are Brittany Webster, Shayla Swanson, the Fortier sisters, Amanda Ammar, Daria Gaiazova, Perianne Jones and Madeleine Williams. Once again a png version of this graph is here. The Americans produced some juniors capable of scoring points in sprint races early on in the development of the event, but this has apparently fallen off somewhat. Of course, sprinting has changed dramatically over this time period, so that may be a contributing factor as well. Many of the names are the same as with the distance events. 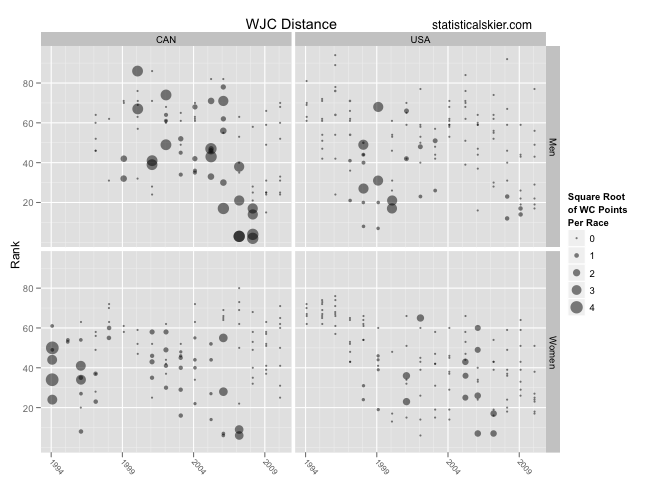 Can you guess who the American women are with non-zero “WC points per race” values? Keep in mind that the only people in this graph are people I’m likely to have WJC results for (so no Nina Kempell or Wendy Wagner, for example, and also exclude people who never went to WJCs for whatever reason), and any top 30 result will do, even if it came back when only 16 people qualified in the sprints. Kikkan Randall and who else? Posted by Joran on Thursday, January 20, 2011, at 12:00 pm. Filed under Uncategorized. 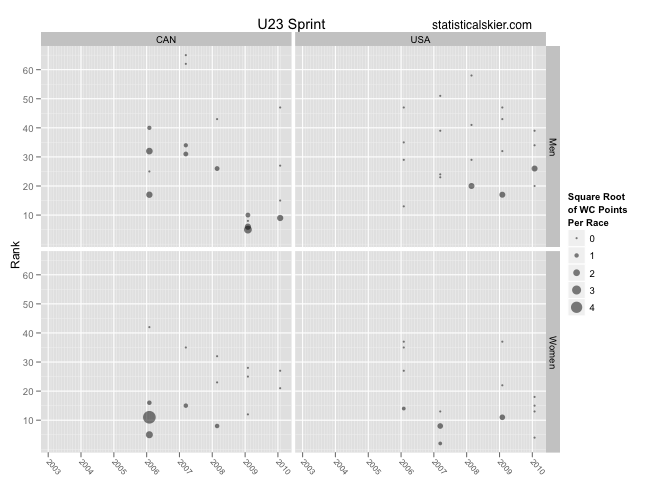 Tagged development, Distance, junior, Sprint, WJC/U23, World Cup. Follow any responses to this post with its comments RSS feed. You can post a comment or trackback from your blog.